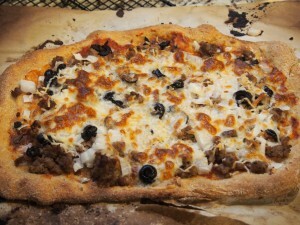 Pizza is one of the best yeast breads for beginning bread maker. Since pizza crusts can be thin, thick, crispy or chewy, there is a lot of error in making pizza dough. So, if you’re just starting out with yeast breads, pizza is a good place to start. This recipe calls for durum wheat flour. If you’ve never tried durum or semolina flour, it has a courser texture than most flours. It will give your crust a little extra bite or chewiness. But don’t skip this recipe just because you don’t have durum flour, substitute it with whole wheat flour and you’ll still end up with a great pizza crust. This recipe is a little unique by callin g for beer as the liquid. But here’s the thing, you can’t really taste the beer in the final pizza crust. So use the cheap beer in the recipe and save the good stuff for drinking. That being said, I do try to use the good olive oil when I’m baking. If you don't have durum wheat flour, just substitute it with whole wheat flour. Combine the sourdough starter and beer in the bowl of a stand mixer or mixing bowl. Stir until starter is dissolved. 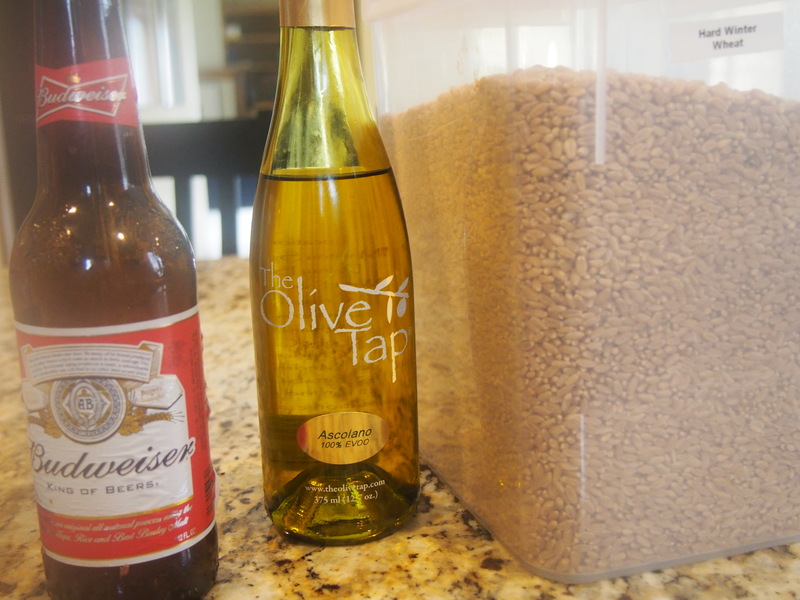 Add yeast, baking powder, salt and olive oil to the beer mixture. Add flours to remaining ingredients to make a slightly sticky dough. Adjust the flour or add water to make a nice, sticky consistency. Knead dough until it is smooth, but still a little sticky. Add as little extra flour during the kneading as possible so that the dough stays sticky. Using a stand mixer will help with the kneading. Let dough rest 2-4 hours on the countertop. When ready to bake, preheat oven to 450 degrees for about 30 minutes. If you have a baking stone, preheat it in the oven. Divide dough into 2 to 4 round and shape each round into a pizza. I shape mine onto parchment paper. Use a wooden peel to slide each dough one at a time onto the pizza stone. If you don't have a pizza stone, bake the dough on a cookie sheet. Bake for 5 minutes until just crisp. Remove from the oven. Add pizza toppings to the dough and bake another 7 minutes until cheese is melted.